'corn blisters' anyone seen these before? I saw these hands the other day. I was a bit baffled! Has anyone else seen anything like this? Re: 'corn blisters' anyone seen these before? A photo would be more helpful than an inkprint. I think it is dyshidrosis (dishydrosis, dyshydrosis, dishidrosis). It's caused by extreme and prolonged stress. Often on work-a-holics. 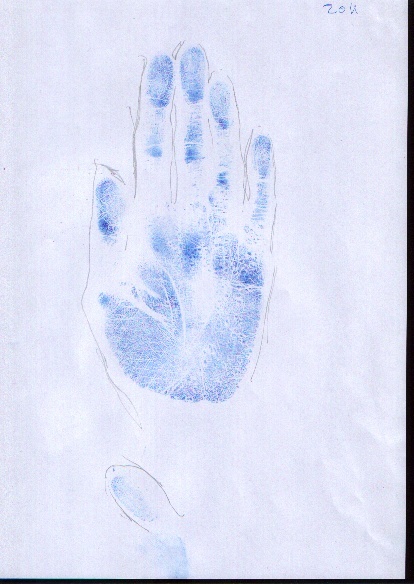 Patti wrote: A photo would be more helpful than an inkprint. 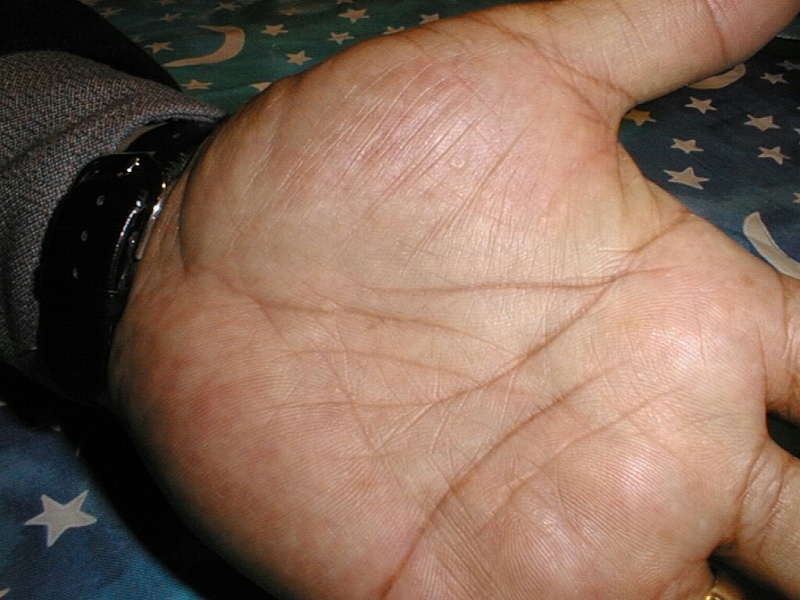 The blister appearance is the reason they were named dyshidrosis. They were thought to be clogged sweat pores. Interestingly, I haven't done a web search regarding them for a number of years. I saw them on stressed out people. Children taking on too many extracuricular activities and parents working full time jobs, single parenting and volunteering for all their childrens school projects, etc. Now I see that the searches verify they relate to stress. ! They do not go away completely. Instead they become flat, tiny, shiny dots. They can re-erupt and rise when the stress comes back. Noticible more by the tingling or itching. They are not contagious. From feedback, I am pretty convinced that their locations relate to the areas of life that a person is stressed out. 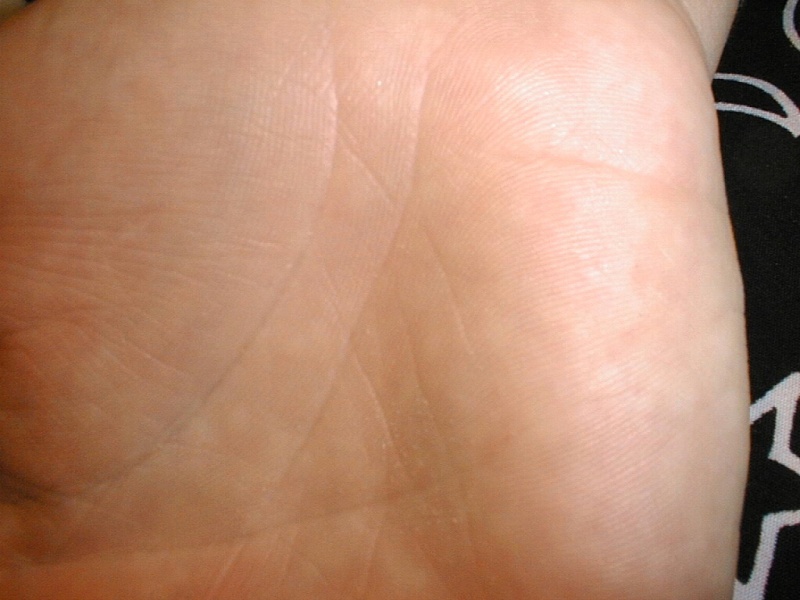 The most common locations are the Thenar area, Jupiter mount and entire hypothenar area. They are more common on ridged skin, but in combination with eczema they can be anywhere. Here you can see an old spot with a sunken center inside a 'square' on the thenar mount. Another bump is just downward to the right. A few tiny bumps along the health/Mercury line are also visible. Here's another where you can see a cluster of bumps along the health line.